Cycle in new desktop pictures from various sources. Is there a better alternative to Laundry? 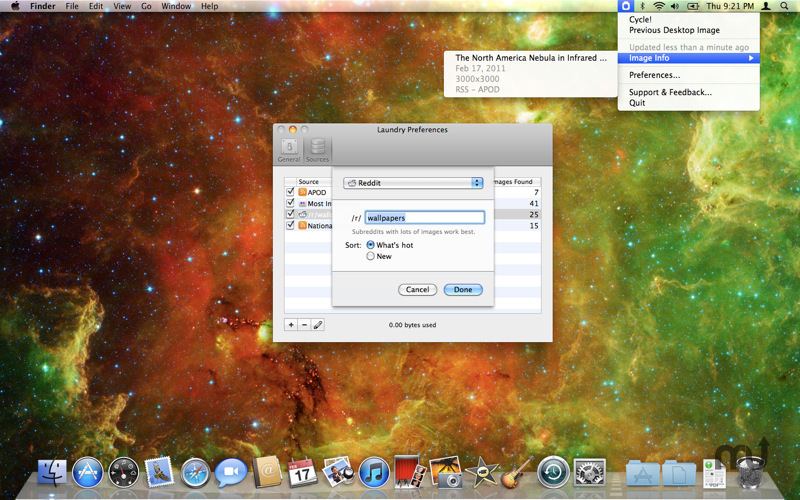 Is Laundry really the best app in Desktop category? Will Laundry work good on macOS 10.13.4? Laundry helps keep your desktop fresh by cycling in new desktop pictures from RSS feeds, Flickr searches, or Reddit subreddits with more sources on the way. If your desktop stinks, all you need to do is Laundry. Automatically cycle your desktop on a timer or manually with a hot-key or menu item. Flickr, Reddit and RSS support. More sources coming soon. Leave feedback on your favorite image sources to help determine which ones will be included next. Easy to use interface with many default image sources to get you started. Supports multiple monitors so all your screens stay fresh. Fixes a handful of bugs with compatibility on some feeds and Reddit. Laundry needs a review. Be the first to review this app and get the discussion started! Laundry needs a rating. Be the first to rate this app and get the discussion started!